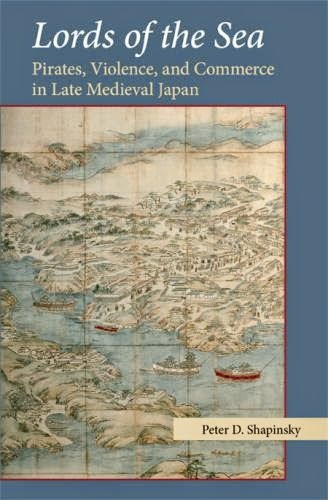 I want to announce a new entry in the Michigan Monograph Series, Number 76, published by the Center for Japanese Studies, University of Michigan: Peter D. Shapinsky's Lords of the Sea: Pirates, Violence, and Commerce in Late Medieval Japan. Lords of the Sea revises our understanding of the epic political, economic, and cultural transformations of Japan's late medieval period (ca. 1300–1600) by shifting the conventional land-based analytical framework to one centered on the perspectives of seafarers who, though usually dismissed as "pirates," thought of themselves as sea lords. Over the course of these centuries, Japan's sea lords became maritime magnates who wielded increasing amounts of political and economic authority by developing autonomous maritime domains that operated outside the auspices of state authority. They played key roles in the operation of networks linking Japan to the rest of the world, and their protection businesses, shipping organizations, and sea tenure practices spread their influence across the waves to the continent, shaping commercial and diplomatic relations with Korea and China. Japan's land-based authorities during this time not only came to accept the autonomy of "pirates" but also competed to sponsor sea-lord bands who could administer littoral estates, fight sea battles, protect shipping, and carry trade. In turn, prominent sea-lord families expanded their dominion by shifting their locus of service among several patrons and by appropriating land-based rhetorics of lordship, which forced authorities to recognize them as legitimate lords over sea-based domains. By the end of the late medieval period, the ambitions, tactics, and technologies of sea-lord mercenary bands proved integral to the naval dimensions of Japan's sixteenth-century military revolution. Sea lords translated their late medieval autonomy into positions of influence in early modern Japan and helped make control of the seas part of the ideological foundations of the state.